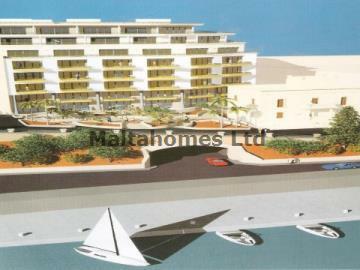 A five star residential development situated on the seafront within the picturesque and popular locality of St. Paul's Bay. This is an exclusive and most prestigious state of the art development of very highly finished Apartments and Penthouse. As of February 2007 there are a handful of Apartments left for sale to include one Penthouse, these residences set a standard of which, many others try to accomplish. Surrounded by diverse but complimentary activities, this prestigious complex will strengthen the existing residential market in the area, using the very best material in order to achieve a most comfortable lifestyle in which you would expect from a luxury development complex of this magnitude. All Apartments/Penthouse, boast what has to be said as one of Malta's finest views of St. Paul's Island and beyond. We strongly recommend internal viewing of the two remaining ground floor Apartments to truly appreciate this unique investment opportunity.